If staying social is the key to the new web, your eBay profile is the hub of your eBay user interaction. 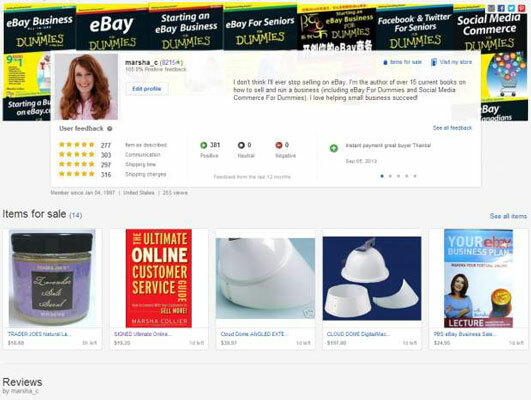 Your About Me and your profile pages are there for customers and the eBay community. People like to know about other people, and your eBay pages let folks know with whom they are transacting. It’s all too simple: To get to your profile page, click your User ID on your My eBay page — or any eBay page for that matter — even when you click your User ID after clicking “Hi” at the top right of any page. Items for sale: Images and links to your current listings. Collections: Links to items you have chosen to “add to your collections” from eBay item pages. You may make many collections, and set them to be private or public from your profile page. Following: When you chose to follow an item search, or an eBay seller, they will show up here. If you are following a search or seller for your own personal research, you can choose to make those selections private by clicking on the word Public under the image on the profile page. Upload a profile photo: Click the pen icon in the corner of the square next to your User ID. The page will prompt you to upload your profile image. Choose a profile photo that portrays you and your personality. There are no set requirements for size at this point; a close-to-square headshot looks best. If you do not select a headshot, your face might be too small for folks to see. Upload a cover photo: Just as on Facebook, you may upload a photo for the top of your page. Keep in mind that text covers a good deal of the cover photo, so don’t select a picture where the most important spot is at the bottom. When you’re selecting (or cropping) an image for use as a cover photo, keep in mind eBay’s recommended 1200 pixels x 270 pixels size for best viewing. Also eBay prefers image files to be smaller than 5MB. Add content: Here you have 250 characters to talk about yourself, your eBay life, or the items you enjoy selling or buying. It is easy to share a link to your profile or find other buyers and sellers by typing an eBay ID into an eBay URL, like this: www.ebay.com/usr/<User.